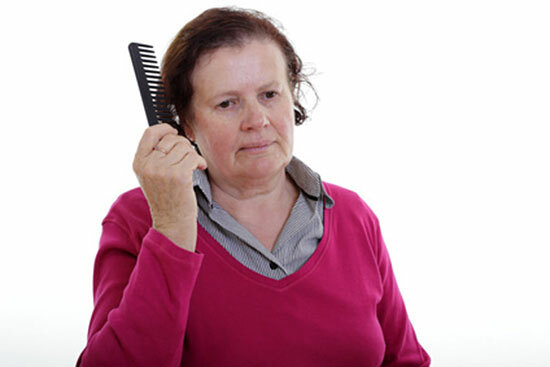 Hair loss is normal for women, and it’s not unusual for the rate of loss to increase as you age. Sometimes, though, hair loss can be a sign of a physiological imbalance. If you are concerned about hair loss, it is worth exploring the possibility that your thyroid gland is not functioning properly. It’s important to understand the type of hair loss that is typical of a thyroid imbalance. If you are losing your hair in a way that results in bald patches, it is usually related to your adrenal glands. When your thyroid is not functioning properly it causes a general overall thinning of your hair. You will find disconcerting quantities of hair in the shower and your hairbrush, but you will not be able to look in the mirror, point to a spot and say, “That’s where it’s all coming from.” Sometimes you’ll notice that the overall amount of hair is more diffuse and the hair strands themselves are fine and dry. Your thyroid affects the hair growth on your scalp and eyebrows. If you are experiencing the loss of other hair – body, eyelashes or pubic hair – this is not related to your thyroid but usually your adrenal hormones, such as DHEA. An easy way to check the severity and cause of your hair loss is to do the pencil test on your eyebrows. Simply hold a pencil at the outside corner of your eye and look to see where it intersects your eyebrow. If your thyroid is healthy, the outer point of your brow should extend beyond the pencil, making up about 1/3 of your eyebrow. The thyroid gland causes hair loss when it produces either too much or too little hormone. Hyperthyroidism, occurs when there is too much thyroid hormone, if you find yourself feeling hot, jittery and over stimulated, this may be the problem. Hypothyroidism, on the other hand, leaves you feeling sluggish, gaining weight, depressed and chilled. Some people with a thyroid imbalance are iron deficient, which contributes to hair loss. Hypothyroidism causes malabsorption in the digestive tract and because nutrients such as iron are difficult to absorb, you can become anemic. Have your doctor check your iron and ferritin levels to be sure you are getting enough. 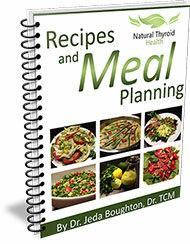 Fortunately, hypothyroidism can be treated. Hormone replacement with an oral medication is the most common approach. Options include both synthetic and natural forms. However, many people are able to avoid or reduce hormone replacement by using holistic therapy to help strengthen thyroid function. Successful treatment of your thyroid malfunction can reverse hair loss, but it can take weeks for your hair to begin to grow back. Have patience, it takes time to bring your endocrine system back to balance, and it is worth it for the health of your entire body.